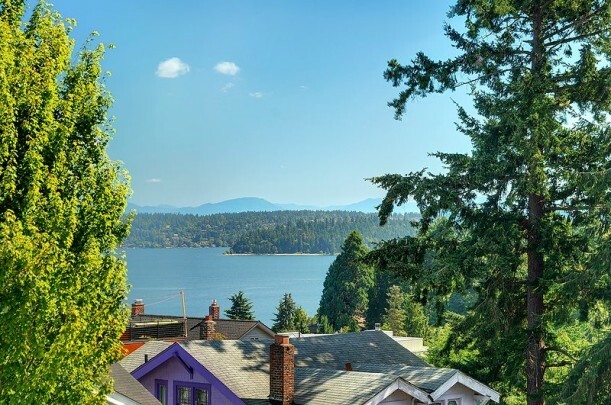 This house was built in 1912 in Mount Baker, an urban neighborhood of Seattle known for its Craftsman-style houses and popular biennial Home Tour. As you can see, she was a Plain Jane with the front door kind of hidden on one side of the house and shutters that weren’t right for the period or style. Wow. Right? I love that new front porch. They had to pretty much strip everything down to the bones and start over. 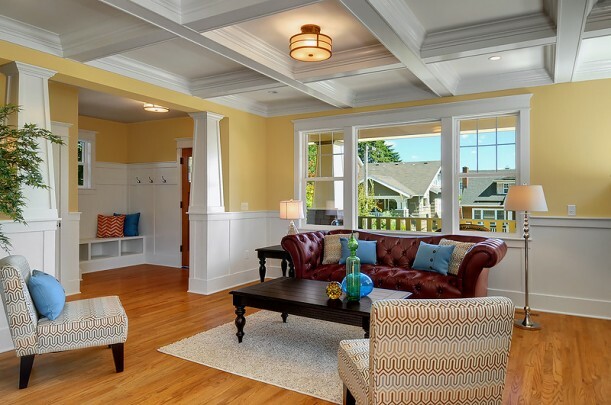 They wanted to maintain the look of the period, so they included plenty of moldings and built-ins that were long gone. Katie Kepler is the listing agent for the property, which was listed for $949,000. It went on the market last week and is already pending. Visit Heaton Dainard for more photos and information. Perfection. They had me at the front door. Not only is the renovation gorgeous, but whoever staged it for the photos did a great job. 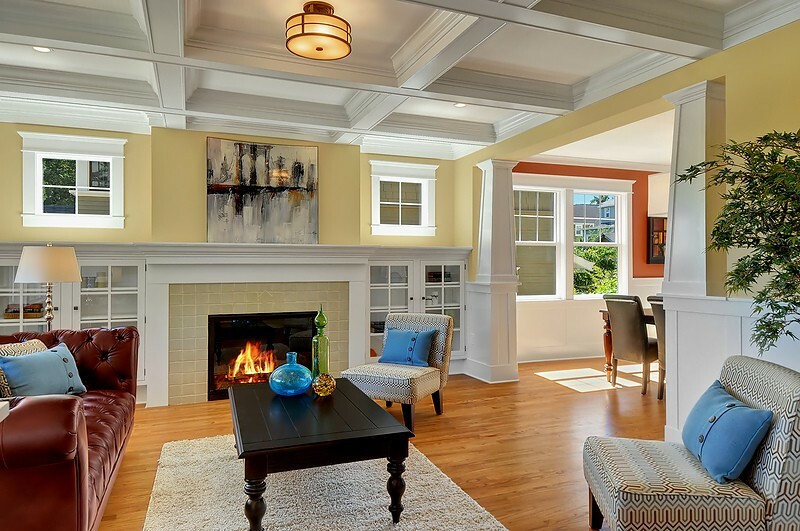 I would love to have a house where I could do that criss-cross ceiling treatment in the living room (I don’t know the design term for it). It makes the room. Would they care to share with us how much the reno cost? Congrats to those “pending” new owners. Lucky. Perfection! 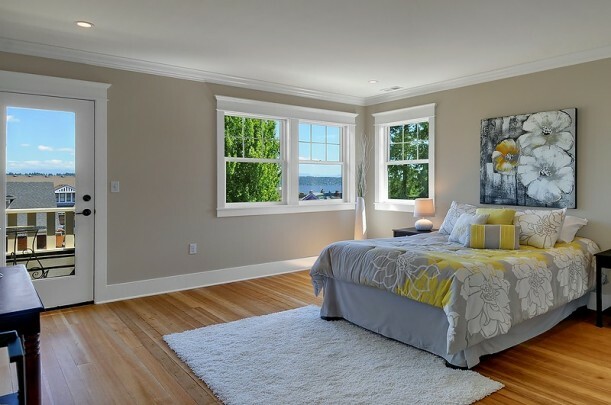 I am wondering what paint color was used in the bedrooms and bathroom. I looks like what I used in my bathroom. If not the same, still loved it. I would love to know the paint colors used in the house too. So bright and happy. I love this house! Everything about it. Great remodel! They did an amazing job! Great house in a great location. I’m kind of sad though that there was no original features left to work with. But they did a bang-on job with the old shell they were given! Beautiful. I usually don’t like Craftsmen inside because of all the dark, dreary wood. 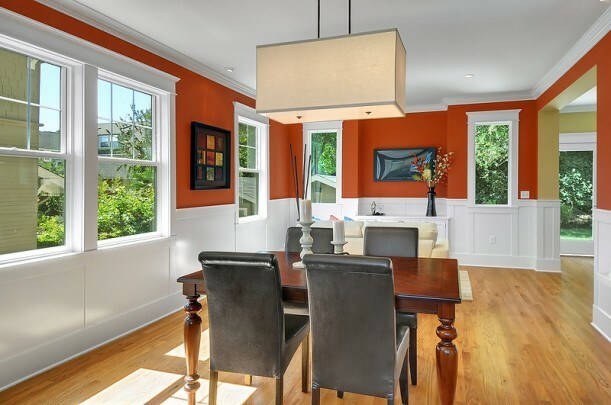 But this one has the wood painted, and it is so much brighter and fresher. I wonder what it looked like originally. You can see where there were two upstairs windows, and a centre door downstairs framed in on the front. Everything about this house is gorgeous! Great job on the remodel. I’m sure the neighborhood is glad to see this “diamond in the rough” all polished up. I don’t know what’s going on with the unrealistic looking real estate photos, though. 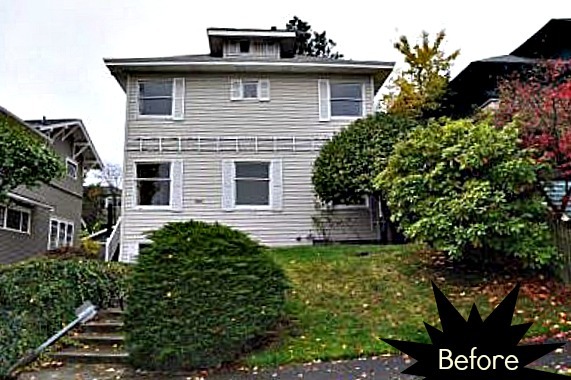 When we were house hunting last year I noticed that the home interior and yard photos for some of the listings were unaturally crisp (for lack of a better word) and distorted to appear larger in picture than they were in person. I’m all in favor of high quality photography, but please keep it real! Thanks so much for my friday day-dream. The after makes me think anything is possible. 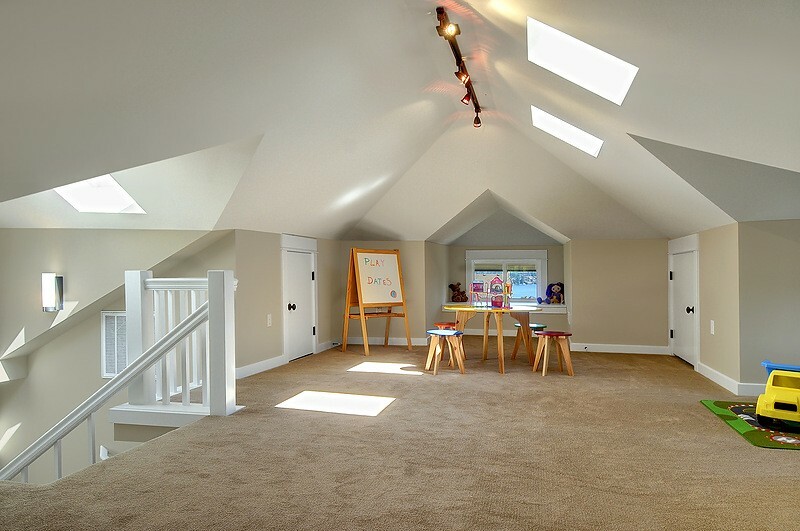 The link shows a basement view and the attic “playroom shows me that there is a whole house to live in. Love it, the house is so lucky. Thanks Rick. I was pretty sure “criss-cross” was not the official historic Craftsman term!!! Wow is right. It’s gorgeous! Beautifully done! I’d buy this house just for that playroom! My kids would love it! Have a blessed weekend, Julia! Whoa, that’s beautiful! I can see why it’s already pending a sale. I love it. Absolutely scrumptious. You should be on Pinterest so we could all repin this! Wait! You are on Pinterest! I just found yooooouuu! Just wow. I love how they’ve styled it with the bare minimum of stuff and no window dressings to really show off all the architectural elements. I would live there in a heartbeat. 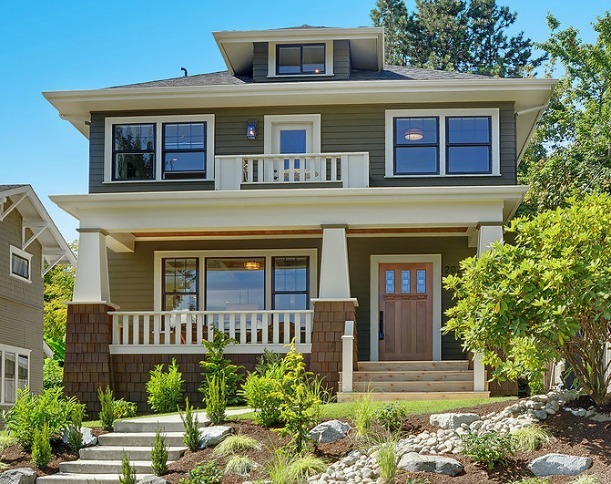 Though I prefer the original woodtone trims in A&C houses (that’s what they are SUPPOSED to look like), I find that the “Beach Craftsman” with the white woodwork is also lovely if done right. It’s a crime to paint quartersawn oak, but since I’m sure it’s not QS under there in this house, I’m all for it. I love the loft and the kitchen. Those grey subway tiles are unusual and interesting. They did a great job, and the porch is spot on. woaw, that front door changes everything! Looking at the before picture it seems we were looking at a rather ugly backyard. Great B&A! Wow absolutely my favorite type of home, they did a super job! Love it!!!!!! 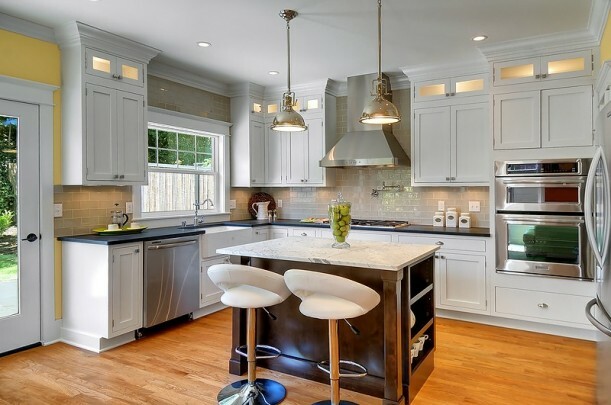 Love the yellow in the kitchen, makes it more lively than the white on white you usually see. It really doesn’t look like the same house on the outside any more. I’m always a sucker for a front porch. Beautiful job! 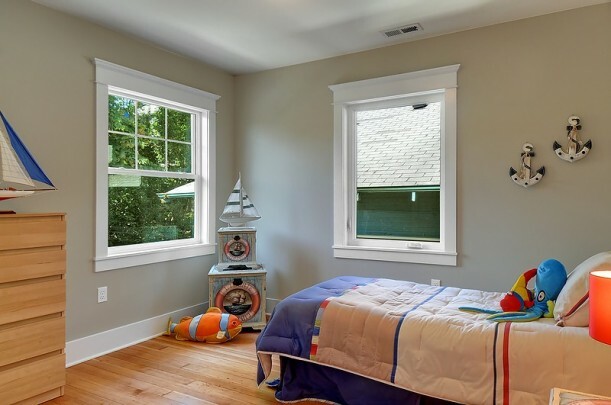 The exterior is fantastic, and they did a very good job with all the moldings and trim inside. The only place that’s a miss for me is the fireplace tile. Dull! I’d have liked to see a more vibrant color, not beige. Wow I love it except, the orange walls. But the tranformation outside is amazing and I love all the decor on the inside. Wow, that’s incredible. I am DYING to know where they got that front door. We have an old house and the original front door desperately needs to be replaced. Nothing looks worse on an old house than an off-the-rack door from a big box home improvement center. I need to either find a source for authentic historic front doors or find someone who can custom make me a door and all its surrounding woodwork, side lights, etc. Thanks for the great feedback! That particular door is from Frank’s Lumber in Seattle..
Wow, what a great improvement to the neighborhood! I’d have to say it is close to perfect! As a Seattle resident, this makes me drool! Great renovation! 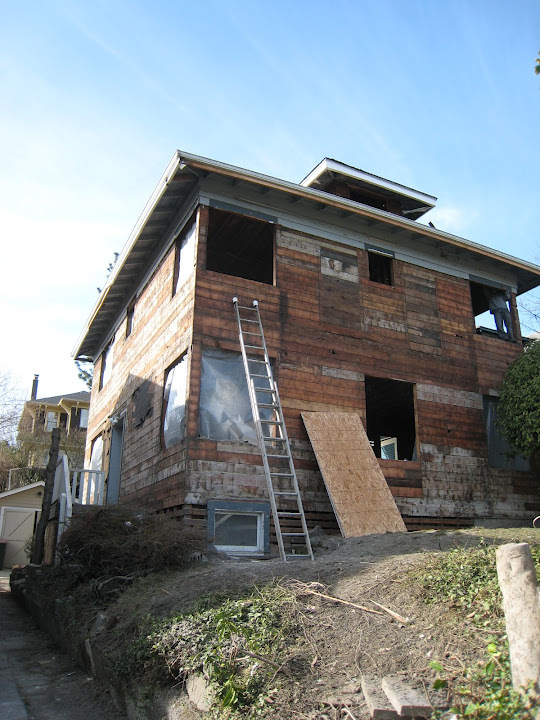 Does any one else think the upper windows had a different configuration originally, even before this reno was started? OMG I love every last thing about this house! Drooling right now. Love everything about it!!! Would love to lknow how to decorate like that!!! Wow what a stunning remodel. 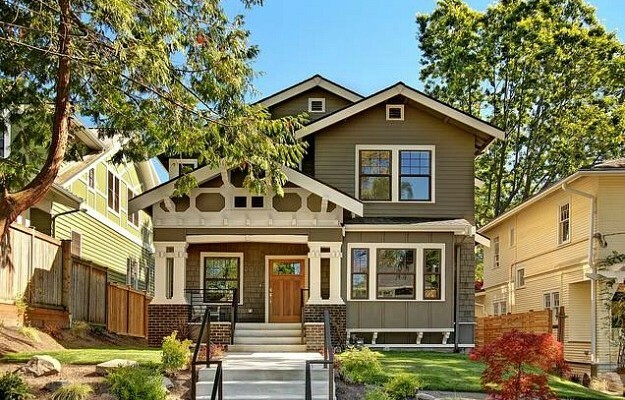 Craftsman’s are one of my favorite styled homes and they did an amazing job with every single detail. Wow, other than the orange paint in the den — Want! An absolutely amazing transformation. I love the big front porch and the lovely landscaping, but the front room with those white beams! Striking! Oh how lovely! It’s such a sweet house and definitely a place I can live in. 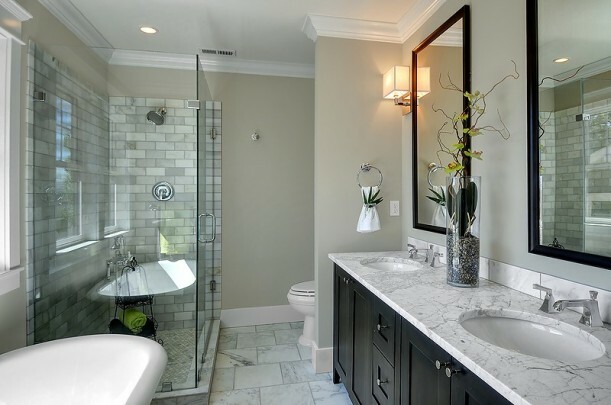 I love the foyer and the bathroom. Also the kitchen. They did a wonderful job. I love watching the show Rehab Addict on Hulu. This post reminded me of that show. Well, this certainly took my breath away. Every room. Every detail. And the light and views. Oh my. Good start to the weekend. Thanks so much for your blog. It’s such a joy to follow! I’m a huge fan of this style of house and this one does not disappoint! Minus a few design choices (stools at kitchen island, lighting over dining table), I love every last part of this house! This house makes my heart stop. This took me back to Bob Villa and the first season of “This Old House”. STUNNING! I LOVE every home that gets a happy ending:) Great post! So pretty! I love the colors and spaciousness. Great job! I’m in love! That has to be one of the most gorgeous houses I’ve ever seen. The imagination on these type projects always amazes me, I don’t that kind of imagination! WOW Julia this is absolutely stunning. I don’t know which part of this home I love most so I’ll take it all (if only). I don’t know how you are going to top this. Thank you for sharing beauty as always Regards Esther from Sydney (it’s 12.30 pm Sunday – day dreaming time). Amazing transformation. Can’t get over the price and how expensive real estate is in Seattle. I’ve been lurking here for a few months now and it is my favourite guilty pleasure. Such a lovely house. 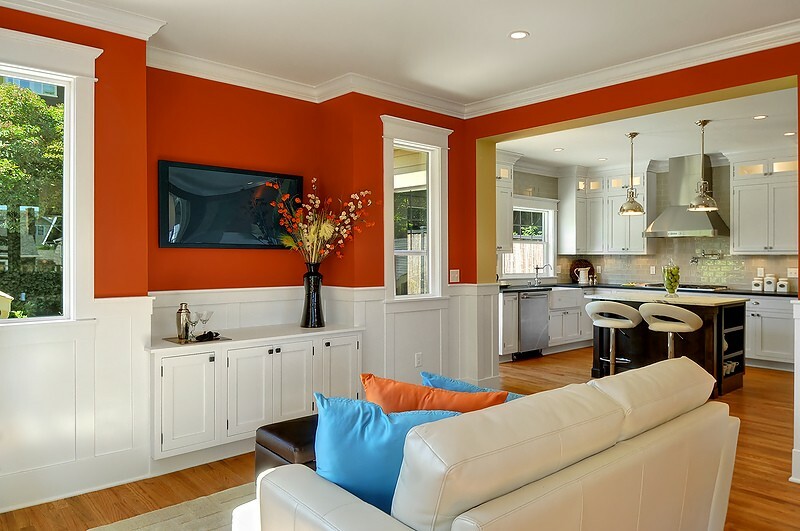 I love the use of bright warm colors on the walls. and the bed room and kitchen are breath taking. every thing about this house make me want it! specially the light that comes in from almost every corner! perfect design. and for me who’s now dealing with remodeling her own house and kitchen, it’s refreshing to see these remodeling ideas. I’ll post some pictures of my apartment when it’s done. wish me luck with all the cleaning process after!!! If the new owners of this house think it’s haunted, it’s just me coming back to look at it over and over and pretend I live in it. 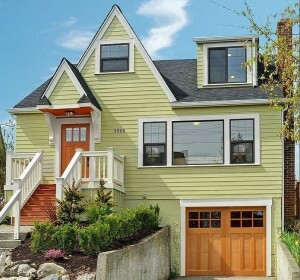 I’ve never been to Seattle, but I’ve always imagined it as such a clean city and this is the cleanest looking house ever. The only thing i would change would be the painting over the fireplace which looks like fireplace soot at first glance, although I’m sure it’s lovely close-up. So if that gets changed you’ll know who did it — whoooooo.